Back to back Uganda Cup Champions KCCA FC kick started their cup defense with an eight goal thriller against FUFA Big league side Amuka Bright Stars FC. Mike Mutyaba’s hat trick, a brace from teenagers Allan Okello, Steven Sserwadda and one from injury returnee Julius Poloto was all the Uganda Cup holders needed to gift their faithfuls in this festive season. Steven Serwadda and Mike Mutyaba celebrate. 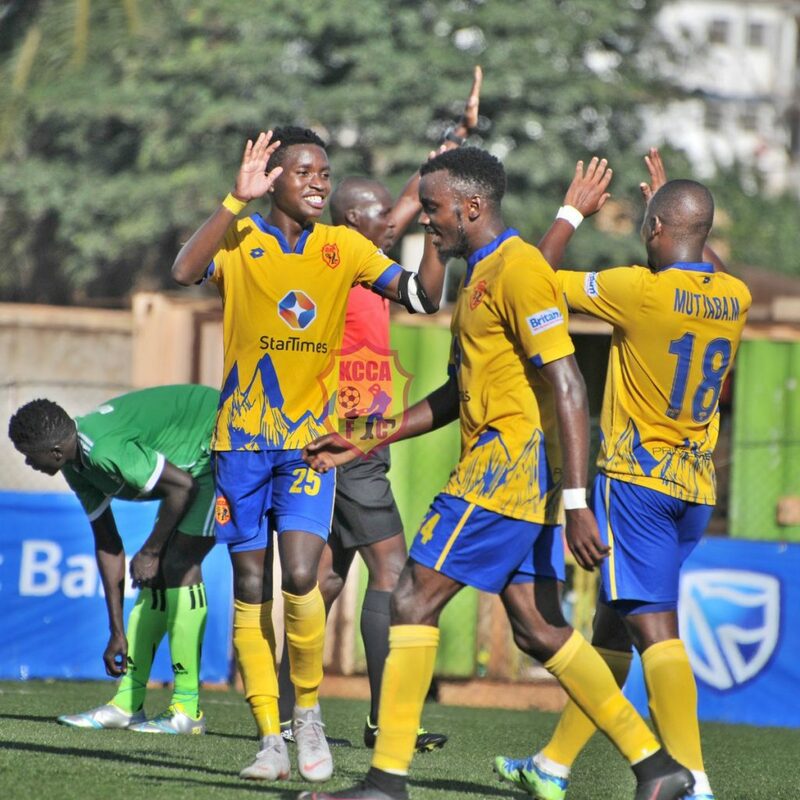 Steven Sserwadda opened the rout with a fine header in the 13th minute and seven minutes later Mike Mutyaba showed calmness when he tapped in from six yards from a well placed pass from the day’s skipper Okello. Sserwadda became the second player to get cautioned for a foul on Emmanuel Okwir who had also been booked earlier on for foul play. Okello in the same fashion like before, set up Mutyaba for him to net KCCA FC’s third from the same spot like the earlier goal on 33 minutes. A minute later, Herbert Achai fed Sserwadda who rounded keeper Shadrack Ssebulime before slotting home his second on the day. With four minutes to play, KCCA FC’s defense napped and Christopher Kirya scored for the visitors but with seconds to play in the opening stanza Mike Mutyaba stretched KCCA FC’s lead to five. After recess, Amuka made changes bringing Daniel Okema and Dennis Omedi for Joel Ayella and James Ocaya. Okello then scored a beauty two minutes to the hour mark and later recorded a brace a minute after the hour mark in a pure teenage combination between him and Sserwadda. KCCA FC then introduced fresh legs in Muzamiru Mutyaba, Jackson Nunda, Herbert Achai for Nicholas Kasozi, Muwadda Mawejje and Julius Poloto. Amuka also introduced Eric Omol for Emmanuel Okwir. Hardly had Poloto come on when he completed the rout with a fine finish from a beautiful cut in from the left flank and a flawless kick past custodian Ssebulime. Bronson Nsubuga scored another consolation for Amuka late on. 8-2 the final score. KCCA FC winners over FUFA Big League side Amuka Bright Stars and progressing to round of 32 of the 45 edition of the Stanbic Uganda Cup 2018/2019 season. Focus now switches to the StarTimes Uganda Premier League with a trip to Jinja on Saturday 29th December when KCCA FC face Bul FC at Njeru Technical Center. KCCA FC players pose for a photo moment before kick off. ← CAF CC | Kaddu’s Motivational Message to teammates Before Mtibwa game.